A review about the beginning of student participation in quality assurance at a national level in spain, experiences and future challenges. By Francesc Marc Esteve Mon, Fernando Miguel Galán Palomares, and María Cristina Pastor Valcárcel. The implementation of student participation in Quality Assurance (QA) has been one of the important challenges that the Spanish university system has faced with regard to the Bologna Process. 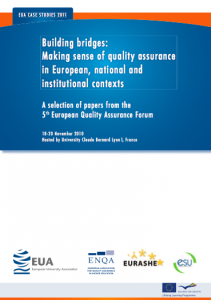 When, in 2005, the European Ministers of Education adopted the “Standards and Guidelines for QA in the European Higher Education Area”, the Spanish National Agency for Quality Assessment and Accreditation (ANECA) began working to find how students could participate in quality matters, since it did not exist in Spain during those days. Two years later, for the first time, Spanish students were taking part in an official institutional assessment programme as observer members of the external evaluation committee, and in 2008 as full members in another programme. Today, students are participating in the verification of recognised degree programmes. This paper aims to review the implementation process of student participation in QA in our country, the achieved goals and future challenges.